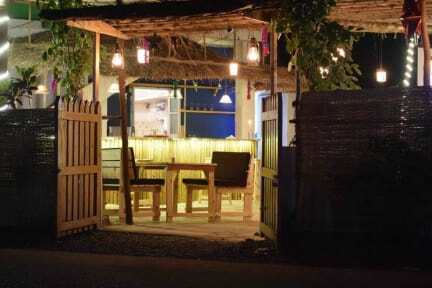 Caterpillar is a small cozy hostel situated in a central location in Anjuna. It is surrounded by a range of cafes, bars and two convenience/liquor stores. Pretty much anything is easily reachable by foot, but most goans and tourists would still go by scooty (you can park accros the street). Caterpillar has two 9-bed dorms with attached bathrooms, plus another shared bathroom downstairs. The downstairs area is all together a small bar/cafe/common area, where we serve free breakfast to our guests, drinks and a growing menu of meals and snacks. It's difficult for me to even know where to being with my review. Upon arriving at the Caterpillar, our first experience of a shared dorm may I add, we were greeted by the wonderful Manish. Easily the most relaxed and laid back human being I've ever had the pleasure to meet. He made checking in a breeze and gave us non-stop help throughout the week, going above and beyond his job title! I'd just like to thank Manish on behalf of my partner and I and would highly recommend the Caterpillar Hostel! What was supposed to be a sudden and unplanned weekend getaway turned out to be one of the most memorable trips of our lifetime. From the open kitchen to the security provided, From suggestions around what to visit nearby to arranging logistics, Folks at Caterpillar work hard to ensure you have a memorable Goa experience. Compassion at its very best. I'd strongly recommend Indians and also international travellers to experience the Caterpillar Hospitality. Cheers guys! See you all soon! Definitely a best choice. Enjoyed the stay. Nice host and best service. Ive been in anjuna for the new year eve. 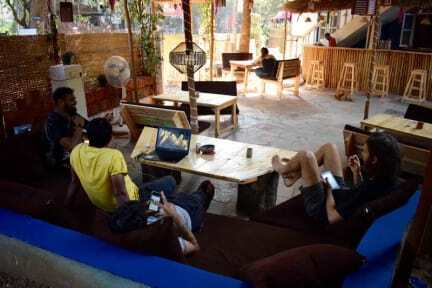 Actually ı didnt like anjuna beach but ı like caterpillar hostel. All the staff was helpful and hospitable. Specially monti. The manager of caterpillar. The Hostel is aproximatle 15 min walk distance beach and party places. My stay at caterpillar hostel was amazing, management ppl, staff ppl etc were very cordial. Lobby setup was amazing to chill, location of the hostel is also perfect. Overall was good experience. Although this hostel is in a good location, it wasn’t clean at all. In the room there were dead bugs everywhere; on the sides, in cobwebs over all the walls, in the bathroom, etc. The bathroom wasn’t clean and the floor was always dirty. As well as all this, there was rat droppings EVERYWHERE. On the floor, on the sides and also under the beds bottom sheet. Whoever made our beds for us obviously didn’t care if we slept on rat poo. Also it says free breakfast on their page, but they lied.